Are fossil fuel subsidies necessary to achieve the rapid progress needed for universal energy access by 2030? Can USD 360 billion spent on fossil fuel subsidies in 2016 be redirected to finance energy access? How can rural areas get support for energy access? What are the barriers for poor households to access electricity connections and cooking equipment? What do women need and want? How do politics influence fossil fuel subsidy decisions? 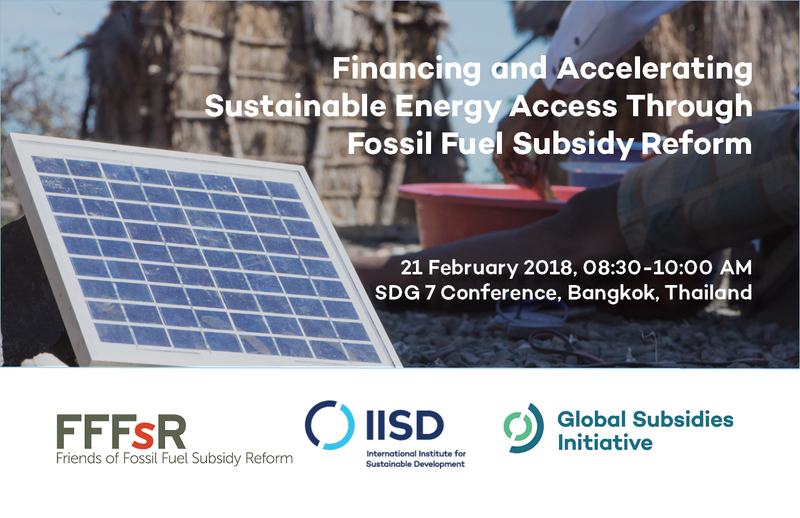 These questions were at the centre of the side event organized by the Friends of Fossil Fuel Subsidy Reform at the SDG 7 Conference in Bangkok, on February 21, 2018. 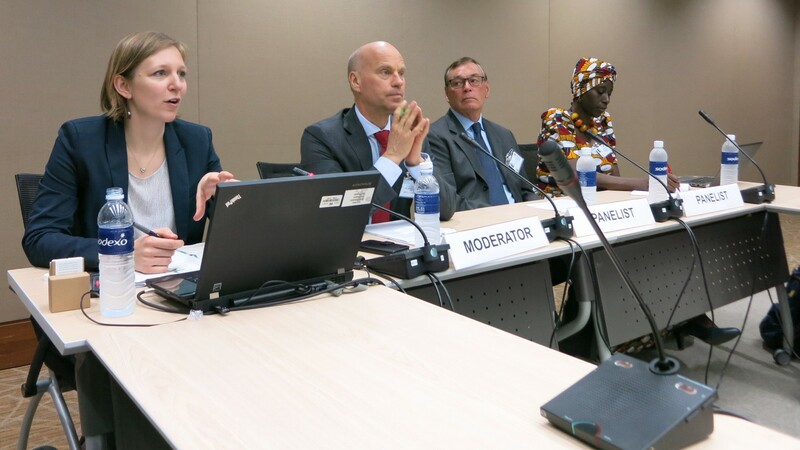 Moderated by Hans Olav Ibrekk, Policy Director for Energy and Climate in the Norwegian Ministry of Foreign Affairs, a panel of experts and an engaged audience discussed how fossil fuel subsidy reform can benefit energy access. Ambassador Peter Rider highlighted the international work by New Zealand and the Friends group to promote fossil fuel subsidy reform. Fossil fuel subsidy reform is supported by commitments under the G20 process and the Asia-Pacific Economic Cooperation (APEC), the SDGs and other forums. In 2017 the issue was also included in the trade debate, when 12 economies joined a Ministerial Statement calling for fossil fuel subsidy reform at the 11th Ministerial Conference of the World Trade Organization (WTO). If implemented well, fossil fuel subsidy reform can deliver a “triple win” for sustainable development, climate change and trade. Global fossil fuel subsidies, with USD 260 billion for consumer subsidies and about USD 100 billion for subsidies to producers per year, are more than six times higher than the USD 52 billion needed per year to achieve universal energy access to electricity or the USD 61 billion needed in total for universal access to clean cooking fuels. I presented on behalf of of IISD’s Global Subsidies Initiative and highlighted how this can hold back energy access. In many countries, fossil fuel subsidies place a heavy burden on national budgets. This can be a major barrier for investments in energy infrastructure, given that 37 per cent of financing for energy access comes from developing country budgets. Subsidized electricity tariffs hold back utilities that are struggling to service their existing customers and might act as a barrier to extend the grid to rural areas. At the same time, this presents an opportunity: reforming fossil fuel subsidies can free large sums that can be reinvested in infrastructure. In Indonesia, reforms of gasoline and diesel subsidies freed USD 15 billion for reinvestments in regional development, social welfare and infrastructure. On the household level, energy access has three main barriers: affordability, availability and awareness. Research has consistently shown that fossil fuel subsidies are an ineffective tool to make fuels more affordable for poor households. Most subsidies are consumed by wealthier segments of the population. For example, in Indonesia 70 per cent of liquefied petroleum gasoline (LPG) subsidy spending benefits households classified as non-poor. Subsidies mostly reach urban households, while rural households either cannot get access to the fuels or pay high mark-ups. Even massively subsidizing cooking fuels cannot compete with collected biomass, as long as women’s time is considered “free.” Fuel subsidies do not solve the issue of availability, especially in rural areas. They can even be counterproductive, as smuggling and diversion of cheap fuels can lead to constraints in supply and insufficient revenues are hampered by investments in distribution. Providing subsidies does not address awareness issues surrounding fuel options. I therefore recommended to remove and reinvest subsidies as much as possible and to target subsidies to poor households, using cash transfers and connection support rather than fuel subsidies. A “swap” to cleaner and healthier alternatives can often present a better solution. Sheila Oparaocha, Energia, made the case for adopting a gender lens when discussing energy sector reform. Research on gender and energy sector reform supported by Energia points to the importance of both electricity and cooking fuels, especially LPG, for the health and welfare of women. Given that 3 billion people still live without access to clean cooking fuels, she made a case for reforming subsidies to benefit the poorest. Better alternatives like solar lighting instead of kerosene should be promoted. Targeting of subsidies should have women as central actors, for example through directing the support to women’s bank accounts and giving women ownership of the technical equipment. She also pointed to large gaps in awareness-raising and research, and called for investments in health and safety of equipment, as well as more convenient and better adapted technical solutions like smaller gas cylinders. Abhishek Jain, Council on Energy, Environment & Water (CEEW) discussed how India is reforming fossil fuel subsidies to achieve its ambitious energy access strategy. India is implementing large-scale programs to accelerate the uptake of LPG for cooking. Connection subsidies have supported 30 million connections through cash transfers to women’s bank accounts. Nevertheless, LPG consumption and the subsidies linked to it are heavily skewed in favour of higher income groups and urban areas. Ongoing efforts are targeting fuel subsidies to lower-income households. In 2014/15, the subsidy shifted from the fuel price to cash transfers to reduce leaking. After a “nudging” approach through the Give It Up campaign, the next step is to refine the list of entitled households through matching with other databases. India is also a frontrunner in exploring opportunities to replace kerosene by solar lighting, an option that is financially viable. The financial health of distribution companies was mentioned as a third issue that prevents investment in extending the grid to rural areas. The ensuing discussion centred around the political difficulties in reforming and targeting subsidies once they are established and the need to take into account the political economy of subsidies. Viable solutions proposed include solar lighting solutions, investments in social safety nets and choosing the right timing for reforms. A combination of good strategies on the technical level and political leadership was seen as essential for successful and long-lasting change. The need to be “fuel-agnostic” was also raised: choice is important, and support schemes should embrace the variety of technologies for energy access, including sustainable biomass solutions and emerging technologies. At the High-Level Political Forum in July 2018, SDG 7 on energy and SDG 12 on sustainable consumption and production will be up for their first review under the heading “Transformation towards sustainable and resilient societies.” Fossil fuel subsidy reform is included as a means of implementation in SDG 12. There is great opportunity, but also great need, for bringing these topics together to reach universal energy access faster, and to finance and accelerate the transition to sustainable energy systems.